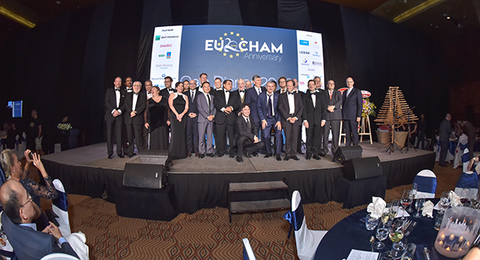 Last Friday, nearly 600 business leaders, investors and ambassadors from across Europe gathered at the InterContinental Hotel to celebrate two decades of EuroCham in Vietnam with a special Gala Dinner. Piaggio won the Business Excellence award, recognising the business that has shown long-term growth and success, been a model of responsible and profitable business and made a real contribution to Vietnam over the last two decades. Digitexx won the Best Entrepreneurship award, recognising the business that has been the most innovative, creative, disruptive and competitive, and overcome challenges to become successful in Vietnam. Belgo won the Best Start-Up award, which recognises the most innovative, enterprising and forward-thinking new European companies in Vietnam. Les Vergers Du Mekong won the Best Sustainability Initiatives award, in recognition of their work to adopt sustainable business practices in Vietnam. This was the most hotly-contested award of the evening, attracting the greatest number of entries.